Representative Matt Gaetz told the Pensacola News Journal his bill to convert beach lease titles only applies to people’s homes. Has the Pensacola News Journal read the bill? Why didn’t they challenge Mr. Gaetz on this key fact? It looks like Gaetz is being disengenuous. Something that seems to have escaped PNJ’s keen journalistic eye. Again. The question is…why? What’s Gaetz obfuscating? Perhaps it has something to do with the fact that his bill only protects public access on Escambia’s beach. Navarre Beach’s future would be up to Santa Rosa Commissioners. And there’s a whole lot more open Navarre beach zoned public access than Pensacola Beach has. Through this whole process, Gaetz has pushed a Navarre Pass, despite longstanding military objection. Now he’s backing off, insinuating he’ll protect military interests. Was this a distraction all along? 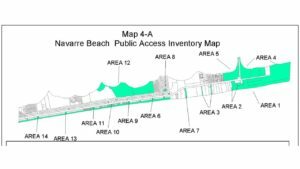 Nobody’s talking about all the other public access zones on Navarre beach that would be up for grabs if this bill passes. PNJ hasn’t touched it. *Beach land behind condos. If condo homeowner associations buy it, they could rope it off to the mean high tide mark. *Navarre Park: will we eventually see condos in the Park? *Parking and walkover areas present lucrative private toll management-tunities, just like the pier. How far can Santa Rosa trust Commissioners with all that lucrative free beach land?